title: Sofia of the Common People (With a Tarikat Slang-Bulgarian Dictionary). My encounter with Milena Iakimova’s book coincided with my arrival in a new city. I read Sofia of the Common People in my first weeks in Cambridge, Massachusetts, while I was getting used to the strange sounds and colours in my new apartment, looking for a new kindergarten, picking out new foods in the store, memorizing the local traffic regulations, browsing a new library, meeting new people and learning the structure and rules of a new university. The last thing I expected was that in Sofia of the Common People I would find parallels with my personal experience and that it would help me make sense of what was happening around me. This book is an impressive interdisciplinary study that can be recommended not just to sociologists, philosophers and historians but also to all readers who want to feel and reflect on the process of discovering a foreign city. The main subject, formulated in the introduction and explored systematically to the very end of the book, is arrival and settling down in an unknown place among unknown people and among a dizzying number of new buildings, cars, sights and smells. Milena Iakimova asks how newcomers find their way around the physical, social and moral spaces of a city when they have ‘no established routes of movement that can help them settle into a rhythm of familiarity’ (p. 10). She is concerned with the question of how immigrants build the history of their life together when the old recipes for living together no longer work and when their previous intimate experience is no longer relevant (p. 12). As Milena Iakimova explains, this ‘means seeing how social order emerges, how status hierarchies emerge and persist, how they become long-lasting codes of mutual identification in the anonymous space of a city undergoing modernization, what normative vocabularies they develop’ (p. 12). Those who are interested in sociology will recognize in this problematics the influence of Alfred Schutz and the figure of his stranger who is exploring the surfaces of the new place in order to fit in, who can no longer rely on the old codes and norms but has not yet discovered, mastered and ‘incorporated’ the new ones. Milena Iakimova follows phenomenological sociology and pragmatism, accepting that the new codes and norms are constructed through reciprocal and joint negotiation (p. 17), but she also goes beyond them. On the one hand, building on Pierre Bourdieu’s critical social theory, she places an emphasis on power as hidden in the process of negotiation, noting that the validity of prescriptions and codes is reconfirmed automatically without being questioned or analyzed, and that this is a mechanism for the reproduction of social inequality (p. 22). On the other hand, taking as her point of departure the approach of the Cambridge historians of ideas – John Pocock and especially Quentin Skinner – the author uses speech act theory to draw attention to the ‘language’ of the new codes and norms by showing how the relevant categories – through their very use – differentiate and multiply their meanings. Thus, even those social strata – ‘the common people’ – that do not possess ‘ideological initiative’ can ‘do things’ with words by virtue of the fact that they use them and, in this way, they actively transform the worlds they inhabit (p. 27). Whereas this problematics in itself is not unfamiliar to Bulgarian philosophy and sociology, Milena Iakimova’s contribution is in that she applies it to a concrete historical context: the capital city of Sofia in two periods of abrupt and sweeping changes that radically transformed the social order, namely, the time immediately after the establishment of the modern Bulgarian state in 1878, and interwar Bulgaria in the 1920s and 1930s. Noting that in each of those decades Sofia’s population increased dramatically, Milena Iakimova identifies the peasants migrating to the city as Schutz’s strangers who would negotiate the new dimensions of their life together and, by that very process, create and establish new social stratifications but also change the categories of life ‘together’ in the course of their use. 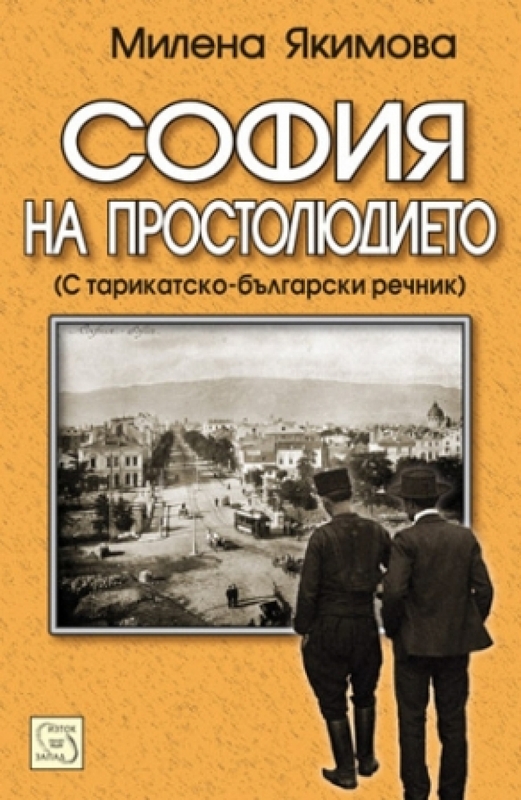 The five main chapters of the book focus on different contexts of the process of multiple regulation in the space of a modernizing city – from literacy, fire safety measures and lighting, to ferroconcrete, hygiene, suicides, local popular lectures and the so-called tarikat slang of young people in Sofia. Each chapter also outlines the profile of separate figures: ‘the clerk’, ‘the servant’, ‘the crowd’, ‘ordinary people’, ‘the soldier-citizen’, ‘the proletarian pale son’, and ‘the crook’. One of Milena Iakimova’s main theses is that the emergence of clerks as a prestigious stratum after 1878 constitutes social stratification of people who were equal by social origin. This social structure was stabilized and normalized in the period until the First World War. According to the author, the interwar period saw a redistribution of social prestige and transformation of inequality: clerks and military officers were pushed down the social hierarchy by professional categories climbing up the social ladder (doctors, engineers, architects, lawyers). This process involved the differentiation of the intelligentsia and the emergence of the categories ‘crowd’ and ‘ordinary people’. In the course of the attempts to rationalize the urban masses, ‘the crowd’ was stratified in its turn – into ‘the soldier-citizen’, ‘the proletarian pale son’ and ‘the crook’, who were likewise re-categorized normatively in order to serve as resources for positive self-perception. Such a perspective on the development not only of Sofia but also of Bulgaria between 1878 and 1939 is unprecedented and should be welcomed unconditionally. It opens up new fields of analysis – at the boundary between social history and historical sociology with their intertwined but nevertheless separate intellectual traditions. And whereas in the field of Bulgarian social history there is an unquestionably seminal book – Rumen Daskalov’s monumental, two-volume Bulgarian Society 1878-1939 (Sofia: IK Gutenberg, 2005; in Bulgarian) – Bulgarian experts in historical sociology have rarely (and only fleetingly) dealt with those decades, primarily in the context of demography and rural-urban migration, preferring to work on the period of socialism and the problematics of everyday life, memory, and law. Rumen Daskalov’s book is a contribution to the same field at first sight only – it is a specific type of social history, in fact, a global-type history of Bulgarian society, which seeks the social relevance of state, army, legislation, industry, agriculture, lending, finance, social structure, women’s movements, education, cultural policy, church, the press, refugees, minorities, sanitation of the living environment, urbanization and communications. This multidimensional and all-encompassing – in fact total – approach is achieved through parallel histories which – although they are loosely integrated together – are presented in terms of structures and processes, and not of events. Sofia of the Common People neither strives to be total nor follows a structural-processual approach in presenting the historical material. In the book this material serves more as an illustration of the author’s consistent, in-depth reflection on the rationalization of life together in the rapidly growing capital city. In this sense, readers who expect a thorough investigation of the fields of life together in Sofia discussed in the book will probably be surprised by the author’s choice, for neither the fire safety system and lighting nor construction and rents or hygiene are presented in such a way. This opens up new prospects for future research by Milena Iakimova, as the field she has set out to explore is vast and very promising. Such a research project could also attract researchers who are already studying separate fields in the 1878-1939 period, such as Gergana Mircheva and Violeta Kotseva-Popova who are researching hygiene, Galia Goncharova who is researching Bulgarian clerks and their professional identity, or Borislava Gakova who is researching urban entertainment in Bulgaria in the interwar period. And of course Chavdar Marinov with his study on architecture, who is cited in Sofia of the Common People but who could have been used more extensively. What the reader definitely will not find in Milena Iakimova’s book is the voice of the common people – probably hoarse and coarse, uninterested in the highly intellectual and technocratic debates on concrete, hygiene and urban planning, but lively, authentic and worthy of our curiosity. In Sofia of the Common People we hear the voice of well-known and well-schooled ‘speakers’: Simeon Radev, Konstantin Jireček, Zahari Stoyanov, Konstantin Katsarov, Chavdar Mutafov, Stefan Mladenov, engineer Hristo Hristov, Geo Milev and Hristo Smirnenski, and even Le Corbusier. When the voice of the common people manages to make itself heard, even if through the pen of the scribe – as is the case with the July 1878 petition of Alide Emina to the governor of Sofia, Alabin (p. 40, cited from published archival sources) – the reader can only enjoy its richness and depth and feel tangibly how this ‘Turkish resident of Sofia’ sought her place in the changed capital city and tried to make sense of the sweeping social transformations she was caught up in. Even the Tarikat Slang-Bulgarian Dictionary, included as an appendix and reprinted from the Rodna Rech magazine from 1930, cannot help us to better hear the voice of the common people because it does not tell us when, where, why and, above all, exactly how the residents of fringe neighbourhoods (and was it only they?) used particular words. The ‘common people’ is still only a silhouette, a vague image that is only just beginning to emerge from the book and that needs to be fleshed out through diaries, letters or complaints of ‘ordinary people’ which could be taken from the archives – be it from the Central Archives or the archives of the city of Sofia, or why not also from the private archives of Sofia residents and their families. Without forgetting Gayatri Chakravorty Spivak’s extremely serious question, ‘Can the subaltern speak?’, it is worth trying to reconstruct their words and to listen to their voice. Schutz, A. (1964) The Stranger. An Essay in Social Psychology. In: Collected Papers. Vol. II: Studies in Social Theory. The Hague: Martinus Nijhoff, pp. 91-105. See, e.g., Vatsov, D. (2006) Freedom and Recognition. Interactive Sources of Identity. Sofia: New Bulgarian University (in Bulgarian). See Mircheva, G. (2011) Marital Health and Eugenics in Bulgaria, 1878-1940. In: Health, Hygiene and Eugenics in Southeastern Europe until 1945. Budapest: CEU Press, pp. 233-271; Mircheva, G. (2007) Physical Education in Bulgarian Schools (1879-1912). Towards Strengthening the Collective Body, Critique & Humanism, (24), pp. 9-21 (in Bulgarian); Kotseva-Popova, V. (2009) Hygiene of the Bulgarians (Ethnological Aspects). Doctoral Dissertation (in Bulgarian); Goncharova, G. (2009). Tracing back the Bulgarian Clerk: Public Images of the Profession (late 19th – early 20th century). In: CAS Working Paper Series (2); Gakova, B. (2002) Entertainment in Bulgarian Cities in the 1920s and 1930s. Historico–Ethnographic Aspects. Doctoral Dissertation (in Bulgarian). Spivak, G. (1988) Can the Subaltern Speak? In: Nelson, C. and Grossberg, L. (eds) Marxism and the Interpretation of Culture. Urbana: University of Illinois Press, pp. 271-313. Milena Iakimova – Sofia of the Common People (With a Tarikat Slang-Bulgarian Dictionary).